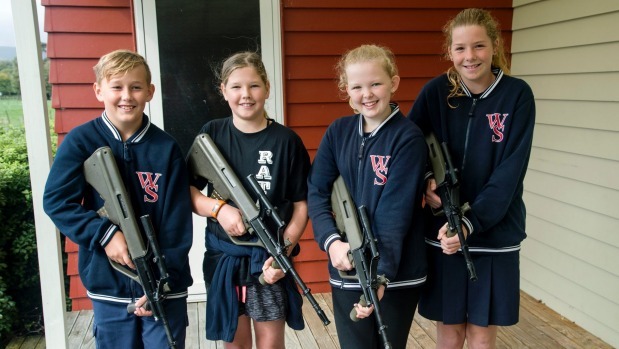 The army is taking guns into primary schools, and the kids are loving it. As part of a programme teaching children about leadership and weaponry, 9- to 13-year-olds get their hands on radios and unloaded guns. The first school visit was on Thursday at Whakarongo School, just outside Palmerston North. Each child was given the opportunity to play with radios and practise disassembling, assembling and firing an assault rifle. “Have the support into your shoulder… When you are ready to fire, take it off safety, and when you get the OK to fire, pull the trigger and then you’re right,” lance corporal Melissa Trail showed the children. The army also spoke about leadership and leaders, such as former All Blacks captain Richie McCaw and Victoria Cross winner Willie Apiata. Top tips for being a leader were honesty, delegation, good communication, confidence, commitment and humour, major Tim Woodhouse told the children. Corporal Israel McNicholl said it was good to show a glimpse of “army life” interactively. “The kids just love the guns, you know what kids are like… but they are not toys. Eleven-year-old Kane O’Hara said the seminar was “really fun”. He had never held a gun before and said “it felt amazing and cool”. Woodhouse declined to comment on the suitability of bringing guns into schools. A Defence Force spokeswoman said queries about if the activities were appropriate should be directed to the school, which had approved the content. Deputy principal Lisa Cuff said the 25 children enjoyed playing with the equipment. She did not think the visit would be controversial. Massey University education professor John O’Neill said learning material from outside organisations should be carefully assessed for value and appropriateness. Firearms safety and learning about the army could be valuable in a longer programme. Child psychologist Kirsty Ross said views on guns in New Zealand were mixed, and rural families were often happy with their safe handling.